Red blood cells contain the oxygen-carrier protein hemoglobin. It is composed of four globular peptides, each containing a heme complex. 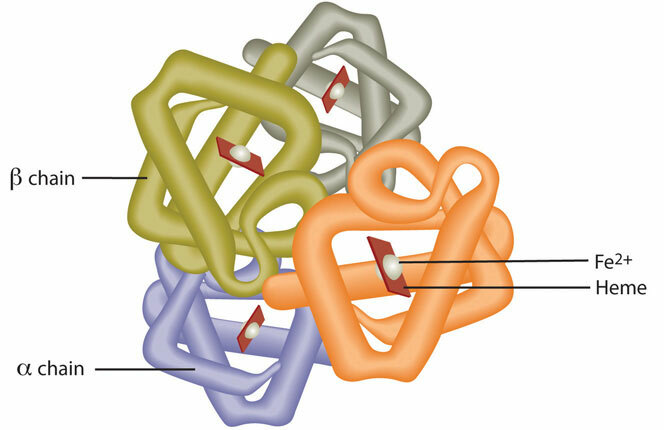 In the center of each heme, lies iron (Figure 11.2). Iron is needed for the production of other iron-containing proteins such as myoglobin. Myoglobin is a protein found in the muscle tissues that enhances the amount of available oxygen for muscle contraction. Iron is also a key component of hundreds of metabolic enzymes. Many of the proteins of the electron-transport chain contain iron–sulfur clusters involved in the transfer of high-energy electrons and ultimately ATP synthesis. Iron is also involved in numerous metabolic reactions that take place mainly in the liver and detoxify harmful substances. Moreover, iron is required for DNA synthesis. The great majority of iron used in the body is that recycled from the continuous breakdown of red blood cells. Hemoglobin is composed of four peptides. Each contains a heme group with iron in the center. The iron in hemoglobin binds to oxygen in the capillaries of the lungs and transports it to cells where the oxygen is released. If iron level is low hemoglobin is not synthesized in sufficient amounts and the oxygen-carrying capacity of red blood cells is reduced, resulting in anemia. When iron levels are low in the diet the small intestine more efficiently absorbs iron in an attempt to compensate for the low dietary intake, but this process cannot make up for the excessive loss of iron that occurs with chronic blood loss or low intake. When blood cells are decommissioned for use, the body recycles the iron back to the bone marrow where red blood cells are made. The body stores some iron in the bone marrow, liver, spleen, and skeletal muscle. A relatively small amount of iron is excreted when cells lining the small intestine and skin cells die and in blood loss, such as during menstrual bleeding. The lost iron must be replaced from dietary sources. The bioavailability of iron is highly dependent on dietary sources. In animal-based foods about 60 percent of iron is bound to hemoglobin, and heme iron is more bioavailable than nonheme iron. The other 40 percent of iron in animal-based foods is nonheme, which is the only iron source in plant-based foods. Some plants contain chemicals (such as phytate, oxalates, tannins, and polyphenols) that inhibit iron absorption. Although, eating fruits and vegetables rich in vitamin C at the same time as iron-containing foods markedly increases iron absorption. A review in the American Journal of Clinical Nutrition reports that in developed countries iron bioavailability from mixed diets ranges between 14 and 18 percent, and that from vegetarian diets ranges between 5 and 12 percent. Vegans are at higher risk for iron deficiency, but careful meal planning does prevent its development. Iron deficiency is the most common of all micronutrient deficiencies. The body excretes little iron and therefore the potential for accumulation in tissues and organs is considerable. Iron accumulation in certain tissues and organs can cause a host of health problems in children and adults including extreme fatigue, arthritis, joint pain, and severe liver and heart toxicity. In children, death has occurred from ingesting as little as 200 mg of iron and therefore it is critical to keep iron supplements out of children’s reach. The IOM has set tolerable upper intake levels of iron (Table 11.2 “Dietary Reference Intakes for Iron”). Mostly a hereditary disease, hemochromatosis is the result of a genetic mutation that leads to abnormal iron metabolism and an accumulation of iron in certain tissues such as the liver, pancreas, and heart. 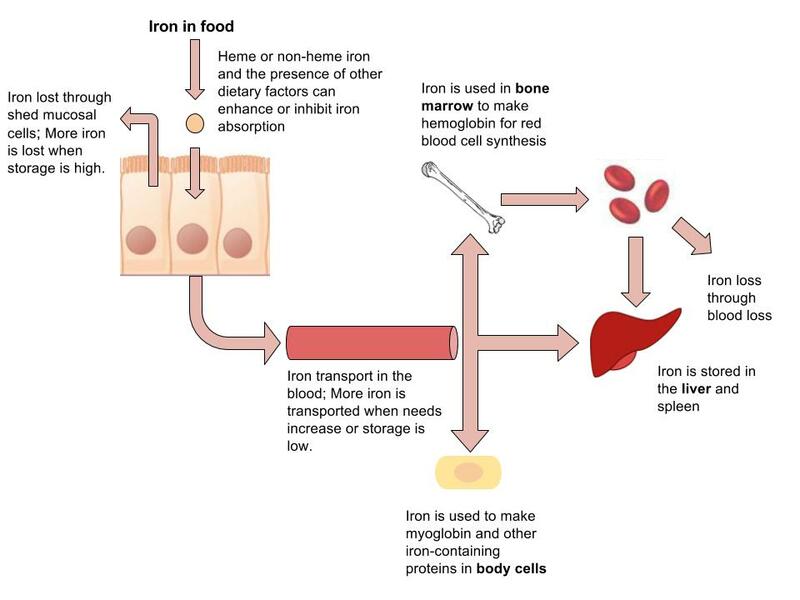 The signs and symptoms of hemochromatosis are similar to those of iron overload in tissues caused by high dietary intake of iron or other non-genetic metabolic abnormalities, but are often increased in severity. Iron-deficiency anemia is diagnosed from characteristic signs and symptoms and confirmed with simple blood tests that count red blood cells and determine hemoglobin and iron content in blood. Anemia is most often treated with iron supplements and increasing the consumption of foods that are higher in iron. Iron supplements have some adverse side effects including nausea, constipation, diarrhea, vomiting, and abdominal pain. Reducing the dose at first and then gradually increasing to the full dose often minimizes the side effects of iron supplements. Avoiding foods and beverages high in phytates and also tea (which contains tannic acid and polyphenols, both of which impair iron absorption), is important for people who have iron-deficiency anemia. Eating a dietary source of vitamin C at the same time as iron-containing foods improves absorption of nonheme iron in the gut. Additionally, unknown compounds that likely reside in muscle tissue of meat, poultry, and fish increase iron absorption from both heme and nonheme sources. See Table 17.2 “Enhancers and Inhibitors of Iron Absorption” for more enhancers and inhibitors for iron absorption. The Centers for Disease Control and Prevention reports that iron deficiency is the most common nutritional deficiency worldwide. The WHO estimates that 80 percent of people are iron deficient and 30 percent of the world population has iron-deficiency anemia. The main causes of iron deficiency worldwide are parasitic worm infections in the gut causing excessive blood loss, and malaria, a parasitic disease causing the destruction of red blood cells. In the developed world, iron deficiency is more the result of dietary insufficiency and/or excessive blood loss occurring during menstruation or childbirth. Infants, children, adolescents, and women are the populations most at risk worldwide for iron-deficiency anemia by all causes. Infants, children, and even teens require more iron because iron is essential for growth. In these populations, iron deficiency (and eventually iron-deficiency anemia) can also cause the following signs and symptoms: poor growth, failure to thrive, and poor performance in school, as well as mental, motor, and behavioral disorders. Women who experience heavy menstrual bleeding or who are pregnant require more iron in the diet. One more high-risk group is the elderly. Both elderly men and women have a high incidence of anemia and the most common causes are dietary iron deficiency and chronic disease such as ulcer, inflammatory diseases, and cancer. Additionally, those who have recently suffered from traumatic blood loss, frequently donate blood, or take excessive antacids for heartburn need more iron in the diet. In young children iron-deficiency anemia can cause significant motor, mental, and behavioral abnormalities that are long-lasting. In the United States, the high incidence of iron-deficiency anemia in infants and children was a major public-health problem prior to the early 1970s, but now the incidence has been greatly reduced. This achievement was accomplished by implementing the screening of infants for iron-deficiency anemia in the health sector as a common practice, advocating the fortification of infant formulas and cereals with iron, and distributing them in supplemental food programs, such as that within Women, Infants, and Children (WIC). Breastfeeding, iron supplementation, and delaying the introduction of cow’s milk for at least the first twelve months of life were also encouraged. These practices were implemented across the socioeconomic spectrum and by the 1980s iron-deficiency anemia in infants had significantly declined. Other solutions had to be introduced in young children, who no longer were fed breast milk or fortified formulas and were consuming cow’s milk. The following solutions were introduced to parents: provide a diet rich in sources of iron and vitamin C, limit cow’s milk consumption to less than twenty-four ounces per day, and a multivitamin containing iron. Provide at-risk groups with iron supplements. Fortify staple foods with iron and other micronutrients whose deficiencies are linked with anemia. Prevent the spread of malaria and treat the hundreds of millions with the disease. Provide insecticide-treated bed netting to prevent parasitic infections. Treat parasitic-worm infestations in high-risk populations. Also, there is ongoing investigation as to whether supplying iron cookware to at-risk populations is effective in preventing and treating iron-deficiency anemia. Iron by University of Hawai’i at Mānoa Food Science and Human Nutrition Program is licensed under a Creative Commons Attribution-NonCommercial-ShareAlike 4.0 International License, except where otherwise noted.